â€œHealthified: Holiday Beveragesâ€� is a three-part series of Total Wellness Magazine. â€œTea Latte Holiday Beveragesâ€� is the second article of the series. 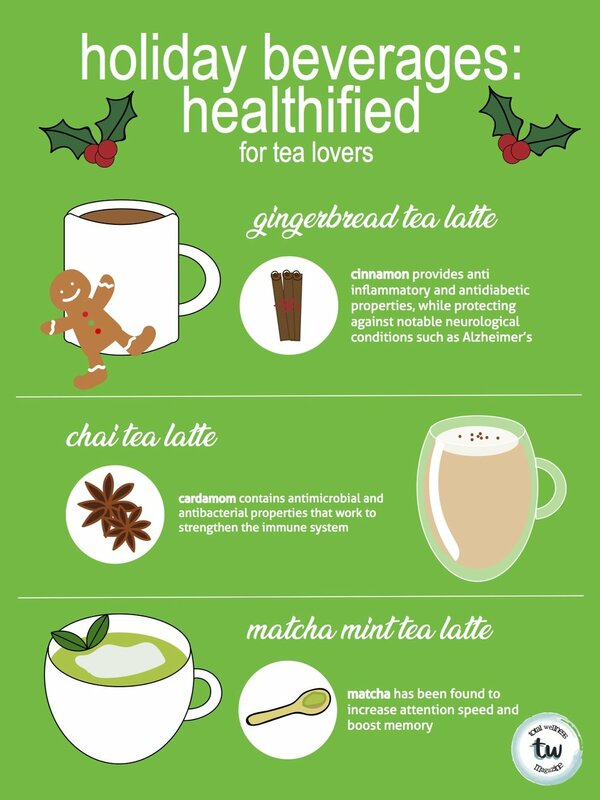 If you are a tea lover, this category of holiday beverages is for you. Whether you prefer your tea plain or in a latte form, the following set of recipes consist of some traditional as well as some modern takes on holiday flavors. They are very personalizable and contain simple ingredients, omitting the preservatives that you would often find in drinks sold at chain coffee shops. Gingerbread tea is a drink that typically consists of a variety of spices including cinnamon, ginger, cloves, and nutmeg. Cinnamon in particular has been found to deliver a variety of health benefits, providing anti inflammatory and antidiabetic properties, as well as protecting against notable neurological conditions such as Alzheimerâ€™s. The tea latte version of this beverage also contains steamed milk. Many store-bought versions are flavored with gingerbread syrup, which contains mostly sugar and water, rather than the actual spices. The recipe below therefore uses real ingredients to deliver the unique spice that characterizes this tea. However, feel free to add more or less of the spices to adjust the flavor to your taste. Mix coffee, spices, molasses, vanilla extract, and agave nectar together in a small saucepan over low-medium heat to the desired temperature. To make it into a latte: *Add in milk, stir well and serve! *If a foamy latte is preferred: heat the milk separately until foamy, then pour milk into the coffee mixture. Chai tea typically consists of a blend of a variety of spices and black tea, offering a very spiced and bold flavor profile. Chai spices typically include cardamom, nutmeg, cinnamon, ginger, which are high in antibacterial and anti-inflammatory properties. Cardamom in particular contains antimicrobial and antibacterial properties that work to strengthen the immune system. Recipes below provide both plain tea and tea latte options, depending on your preference of consistency and flavor. In a medium-sized saucepan, add water and mix in the spices. Once the water boils, turn off the heat and allow spices to steep in the water for 5 minutes. After 5 minutes, turn the heat back on and add the black tea bag and maple syrup. Keep 1/2 cup of chai tea for the latte. Store the rest of the chai tea in the fridge up to two weeks for freshness. In a medium-size saucepan, heat the milk, maple syrup, and pinch of cinnamon until the sides of the milk begin to bubble, stirring often. Once the sides of the milk begin to bubble, remove the pan from heat. In a blender, blend the milk until it's frothy. Pour Â½ cup of chai tea from the previous recipe into a mug. Add the warmed almond milk and all other ingredients to the blender and blend on high for 40 seconds and serve! This beverage takes a fun modern twist on the tradition peppermint flavor that is popular during the holiday times by incorporating matcha green tea. Nowadays, we can find matcha-flavored foods almost everywhere we go, especially in Los Angeles. The matcha trend is on the rise, and deservingly so. Matcha is highly abundant in compounds known as catechins, which are natural antioxidants which help prevent cell damage in our bodies. 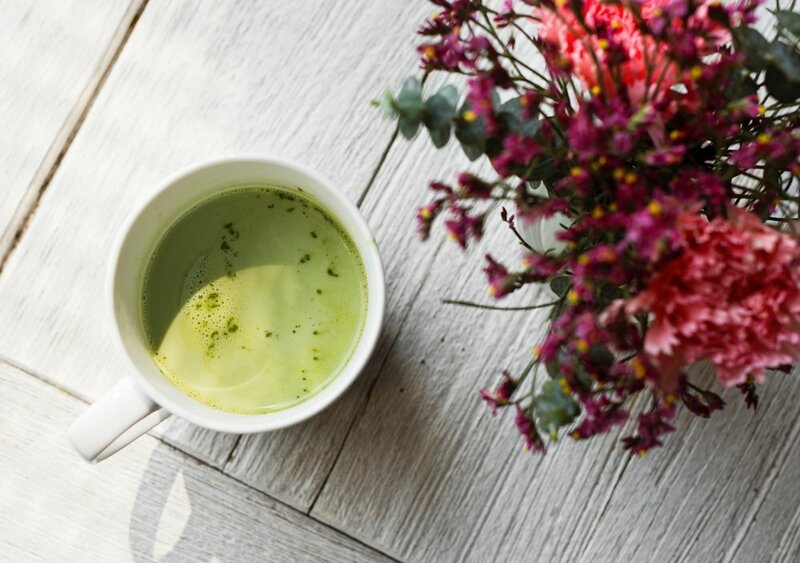 Ingestion of matcha has been found to increase attention speed and boost memory, something that all students could benefit from. The recipes below provide both plain tea and tea latte options, depending on your preference of consistency and flavor. Heat 1 Â½ cups of water in a saucepan on medium heat but avoid boiling. Once water is hot, remove pot from heat and add peppermint leaves. Allow it to steep for 5 minutes. Stir in almond milk and maple syrup. Heat the milk over medium-low heat. Remove the almond milk from heat before it boils. Add and whisk the matcha powder in the milk until well mixed. Add the peppermint extract and agave nectar to the mixture and stir.